How do I receive a quote or place an order? You can expect to have your order processed and shipped within one business day of being placed. However, there are some occasions where OCB will require more lead time in which case a customer service representative will contact you at the time the order is placed. How does Ohio Carbon Blank ship orders placed? Ohio Carbon Blank generally ships orders via UPS. However, if another courier such as FedEx is preferred, OCB will accommodate customer requests. Does Ohio Carbon Blank ship orders internationally? Yes and no. Due to strict exporting laws Ohio Carbon Blank is only capable of shipping low grade graphite, specifically UT3 and UT2E, internationally at this time. Yes if you are local, Ohio Carbon Blank allows customers to pick up their orders. Please see our Contact Us page for our specific location. What is Ohio Carbon Blank's quality certification? 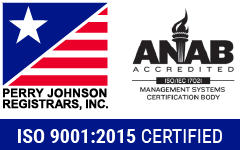 Ohio Carbon Blank is ISO 9001:2015 certified. Click here to view our certification. Can Ohio Carbon Blank machine customer supplied materials? Yes and no. Ohio Carbon Blank can and is willing to machine customer supplied materials depending on the material in question. Please call a Sales Representative at 1-800-448-8887 for further information. Will Ohio Carbon Blank buy back scrap graphite? 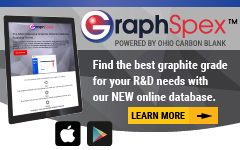 Does Ohio Carbon Blank supply graphite for non-EDM purposes? Yes Ohio Carbon Blank is able to supply all of our graphite grades for non-EDM purposes as requested by our customers. If you have a very specific request please head to our Request For Quote to have our qualified engineers take a look. Does Ohio Carbon Blank have a minimum order quantity? Yes, a portion of our products sold do have minimum quantities. Please contact a member of our sales team for more information (1-800-448-8887). Where can I learn more about Graphite, EDM, and other industry applications? Ohio Carbon Blank offers a wide variety of information regarding our graphite and graphite related applications. Our "Resource Center" contains articles, videos, and test studies. 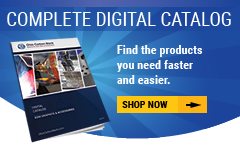 Feel free to browse around to learn more about our products and the industries that we serve. Yes, Ohio Carbon Blank is GeoTrust certified, and we do not store any sensitive credit card information in our system. In the unlikely event of a customer database breach, we will inform all affected customers immediately and will recommend a change in password.